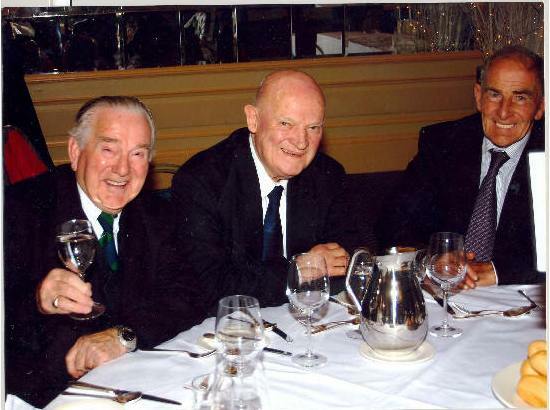 With Deep Regret I learned of the Passing of our Founding Member and dear friend Mr Sammy Spillane, today Sunday Jan 27th 2013. Ar dheis De a raibh a ainm. The death has occurred of SAMMY SPILLANE of Charles Daly Rd., Togher, Cork. Spillane (Charles Daly Road, Togher) On January 27th 2013, peacefully at home, Sammy (late of Kincora Carpets, Eurolift and O’Keeffe Bakery) (founder member of the Cork Branch of the Irish Referees Association). Beloved husband of the late Phyllis (nee Stone) and loving father of John, Elton, Keith, Ronnie, Mary, Theresa and the late Marie (Waters). Sadly missed by his loving family grandchildren, great-grandchildren, sisters, brothers, daughter-in-law Bernadette, relatives and friends. May he rest in peace. Reposing at Sullivans Funeral Home Turners Cross. Rosary Tuesday (29th) at 8pm. Removal Wednesday (30th) at 6.30pm to the Church of the Way of the Cross Togher. Requiem Mass Thursday (31st) at 11am, funeral afterwards to St. James’s Cemetery, Chetwynd. 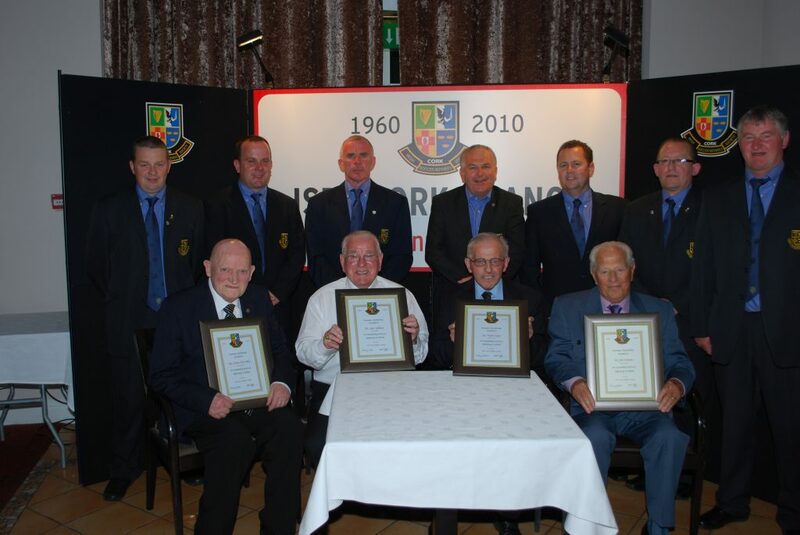 The Committee 2010 and Founding Members 1960 (Sammy 2nd left Front Row) at the 50th Anniversary Dinner May 2010 Rochestown Park. Sammy Spillane was born and reared in Evergreen Street in the heart of Cork City. He played schoolboy soccer, as a right back, with Nicholas Rovers. He then joined Beaumont United before he finally hung up his boots playing for Anglesea United and Morton. His introduction to refereeing was not totally of his own design, as his firm’s representative on the Inter-House League Committee required him to referee any outstanding games that may have been arranged. He was thrown into what turned out to be a crunch match, sending off four players during the course of the game. At the same time his singing career was at it’s height and his decision to stick with refereeing was to pay dividends. After affiliating to the Munster Referee’s Association, Sammy soon progressed from a League of Ireland linesman to the centre spot. He handled his first match at Waterford, where the home side played Dundalk. On the Waterford side that day was former Republic of Ireland international, Con Martin. After the cup final in 1961, his next major appointment was a university international at the Mardyke involving Ireland and England. His growing reputation led him to handle the League of Ireland against the Irish League in 1962. After gaining his FIFA badge in 1961, his first taste of European action came at Goodison Park in October 1962, in the Inter Cities Fairs Cup tie between Everton and Dunfermline as a linesman to Dublin referee Jack Mehigan. Sammy, Owen & Danser at a recent function. March 19th 1963 will live forever in the memory of the likeable Corkonian, as along with his good friend assistant referee, Sylvie Groeger, Sammy boarded a plane for the first time. They were off to Cardiff to officiate at the European Nations Cup tie between Wales and Hungary on the following night. Sammy became the first Cork born referee to handle such a prestigious fixture and the rave notices he and his assistants justly received travelled as far as the Hungarian newspaper “NepSports”. The match ended in an exciting one-one draw, with Sammy needing to award a penalty to either side. The match was a defining moment for Cork refereeing, as it established it’s officials not alone nationally but internationally. Sammy continued to referee a wide variety of matches, from prestigious friendlies, schoolboy internationals, under-23 internationals to further European club competitions. However, his love for local schoolboy football was always dear to his heart. Frank Casey, a colleague of his through the sixties, will never forget his debt to schoolboy football: “Once the nights got long, Sammy, come hell or high water, would always make his way out to Togher on Sunday evenings and referee. Sammy continued to referee in local football through the seventies and eighties, before retiring in 1994. His service to refereeing spanned a remarkable fifty-two years and his involvement in six FAI Senior Cup Finals, three as a referee and three as assistant is unlikely to be ever repeated. During Shamrock Rovers unprecedented success in the sixties, a trivia question going around at the time was: Who, other than a Rovers player or mentor appeared in Dalymount Park as often. The answer of course was Sammy Spillane.